​If the only obstacle keeping your dog from looking as well-groomed as you do is the brown stain around his mouth, there are several ways to remove the unsightly discoloration. Check with your vet first to make sure the stain isn't caused by a yeast or bacteria infection. Wipe the dog's discolored beard with a damp washcloth daily, especially after your pup eats or drinks. This helps remove saliva, water impurities and food dye from the fur. Mix one part milk of magnesia and one part hydrogen peroxide with corn starch to create a paste. Start with a teaspoon of corn starch and stir the mixture to create a paste. If the mixture is too liquid, add more corn starch one teaspoon at a time until the mixture becomes more solid. Wipe the paste on the discolored fur without getting any in the dog's mouth. Leave it on for at least four hours, then remove with a damp washcloth. Repeat daily until the stain fades. Buy a food-safe ceramic bowl for your dog's water. Some metal bowls can rust, transferring the iron oxide to your dog's fur when he drinks. Change the food you give your dog to one that doesn't include dyes. The colors can leach into his fur, causing a dark discoloration. Filter the water you give your dog or use distilled water to remove elements that could be discoloring his fur. If you opt to cut the stained fur, get in the habit of wiping the area with a damp cloth every day to help the new fur stay clean. 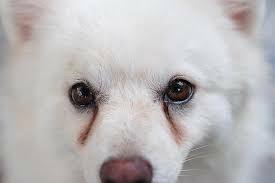 With white-coated breeds such as Bichons Frises, many at some point in their life will develop those very distracting, ugly, red-brownish tear stains underneath their eyes, around their muzzles, and in between their toes. The cause can be related to health issues, shape of the eye, blocked tear-ducts, puppy teething, ear infection, allergies (either food or environmental), and so on. Therefore if your normally white-faced puffball develops aggressive staining seemingly out of the blue, first consult your veterinarian, and possibly a veterinary ophthalmologist, to rule out any underlying health concern. After confirming that your dog is indeed healthy, the following tips and suggestions from my own experience and feedback from other breeders will hopefully restore and maintain that beautiful, white furry face. 1. Examine the quality of your food. 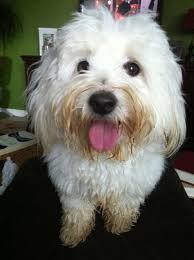 It is generally agreed among Bichon Frise breeders that although there are numerous and passionate opinions about brands (and further passion about kibble versus raw), a high-quality, grain-free diet works best for our breed. The corn, wheat, and meals that are used as fillers in inferior-quality foods just don’t ensure long-term good health and can cause allergic reactions, resulting in excess tearing and other problems. 2. Examine the quality of your water. After traveling a couple of times with my own dogs without their normal water and pouring for them from my own bottled water, I’ve noticed that they will develop staining pretty quickly in response to excess minerals. Use purified, distilled, or reverse-osmosis water sources. 3. Daily eye- and mouth-hair hygiene. Flush eyes with an appropriate canine eye-wash, such as saline eye-wash solutions or Terra Septic eye drops. Wash the muzzle hair with dry shampoo or waterless shampoo and a wet washcloth. You may also try 3% hydrogen peroxide on a paper towel. Comb and blow-dry afterwards. Keep the hair around the eyes trimmed to avoid it irritating the eye and causing tearing. 4. Keep those moist or “rusty” areas dry! Try using glass water bottles (such as made for birds) instead of water bowls, or use paper towels to absorb the excess water around your dog’s mouth after he drinks from a bowl. Cornstarch can also be dusted underneath the eye, around the muzzle, and in between toes. 5. Food additives can help. Two things that have worked for me are adding one teaspoon of either organic apple-cider vinegar or buttermilk powder to meals. I-Stain, a probiotic enzyme, is another product with reportedly good results. Mild antibiotics can be used for short periods of time, naturally, after consulting with your vet. Those commonly prescribed include Lincosin, Tylosin, and/or neomycin-polymyxin or chloramphenicol eye drops. Vetericyn opthalmic gel is available over the counter and may be enough without a vet trip. Stain removal is another chapter to itself, but it’s important to mention that neither I nor anyone I spoke with have had much success with the expensive products advertised for this purpose. A little mild hydrogen peroxide dried into the muzzle (be sure to avoid the eyes) or Visine (applied to the fur, not the eyes) can lighten the color enough to live with it until it grows out. The short of the story is that unfortunately there isn’t just one foolproof preventative, and each dog responds a little differently, so it often takes a little experimenting and patience—but it is worth the effort to have that precious little white face smiling at you again! ​Your out for a lovely walk with your dog, and as you bend down to pick something up from the floor (hopefully your dogs poop! 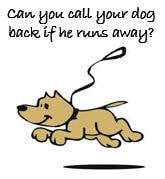 ), you accidentally drop your lead – or you may trip and fall - your dog feels the slackening on it, and the next minute he is running gleefully away, with a look of pure bliss on his face. 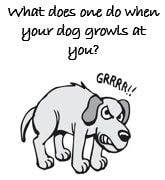 Growling is a valuable and natural means of communication for any dog – something that dog owners should appreciate and respect rather than punish. It is quite obvious that none of us feel comfortable, safe or accepting of this behaviour. Basically, this type of “dirt” is old blood and feces that is left behind when fleas feed on your pet. This dry blood gives them a “black” appearance on skin or hair. If you touch it, it will feel slightly “grainy”, much like fine sand. Gross I know!